TV analyst and retired NBA center Bill Walton recalls arriving at UCLA in 1970, eager to learn about basketball greatness from legendary coach John Wooden. He remembers the first day of practice, when Wooden motioned for the rookies to gather around, notes author Charles Francis in "Wisdom Well Said." Wooden began: "Gentlemen, today we are going to learn to tie our shoes properly." Walton learned how to put on sweat socks correctly, how to warm up correctly and yes, how to tie the drawstring on his shorts. Fold down the top of the waistband. Pull each end of the drawstring until the shorts feel comfortably snug at the waist. Flip one end of the string under the other, make two loops, and pull one loop through the other and draw it tight as if you were tying a shoelace. Flip the waistband back up. Pull the end of the drawstring loop out of the waistband if you have a continuous loop drawstring. Adjust until the waistband feels comfortable. Press your finger on the lapped section of the loop near your navel, make two loops and proceed to tie them as if you were working with a drawstring with two ends. Pull the loops snug. Make an inline figure-eight loop if you want maximum security and don't want to cut the loop. Make two loops in the drawstring, push one partially through the other, and flip the end of partially inserted loop over the doubled loops. Pull the knot tight so that the knot resembles a figure eight with a loop projecting out of its bottom. Cut the drawstring if you don’t like the continuous loop design and make two regular knots at each cut end so the string doesn’t disappear into the waistband placket, the pocket that holds the drawstring. 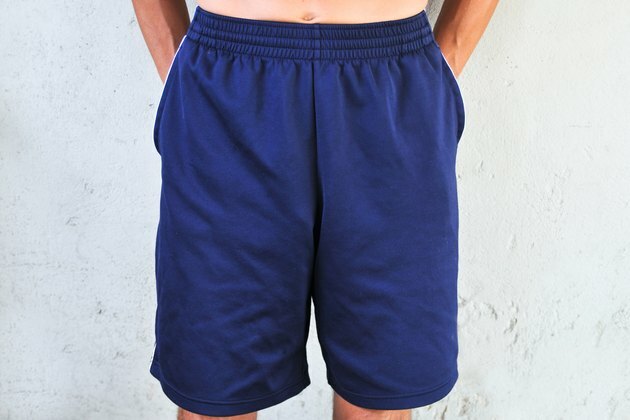 Basketball shorts typically have taut, strong waistbands so drawstrings do not keep the shorts up, but they do keep you from getting them pulled down if an opponent inadvertently tugs on them as part of a deliberate foul. Animated Knots by Grog; The Double Figure Eight Loop ("Bunny Ears"); Alan Grogono, et al.